Guided tours of the facility are available upon request. Our facility is located on Morse Road just 1 mile west of Easton Town Center. We are just west of Westerville Road on the North side of the street. 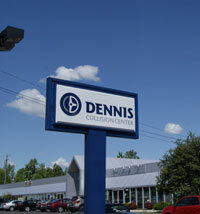 We are a proud member of the Dennis Imports family. 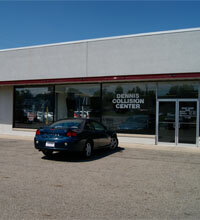 Dennis Collision Center is open to all, and we are trained to repair most makes and models, including Hyundai, Mitsubishi, Suzuki, KIA, Daewoo, Isuzu, Chevrolet, Buick, Ford, Lincoln, Dodge, Chrysler, Cadillac, Honda, Toyota, GMC, Mazda, Subaru, Pontiac, Oldsmobile, Chrysler, Lexus, Nissan, Acura, Infinity and More. Inside, you will be welcomed by a clean, updated showroom featuring both our Estimators, and a selection of vehicles offered for sale here at Dennis Imports. Conveniently located in our Collision Center Showroom, we have Hertz© Car Rental services available. Hertz has at least 2 team members on site at all times the Collision Center is open for business. Don’t need a collision repair? Don’t worry, Hertz is happy to offer rental car services to all customers. While waiting for your estimate, or simply waiting for a ride, our showroom offers a convenient waiting room complete with television, Coffee, and free WIFI access to the internet. Decorating our showroom, you will find examples of our custom paint and graphics techniques on display. These not only add a little character to our facility, but serve to inform our customers of some aftermarket work we do here on a daily basis. Have a custom ride you are considering tricking out with graphics? We can help! We have made a significant investment in the latest in computerized body and frame alignment tools. Here you see one of our two CAR-O-LINER Computerized Frame and UniBody measurement racks. With these racks, we can not only measure for frame damage, but insure that all repairs are made to factory original specifications. Back in our detail and preparation department, we have spared no expense. We have two BLOTHERM “cut in” booths for painting the smaller parts of the car. When your vehicle repair requires a larger paint repair, your vehicle will not only be painted by one of the best Journeyman Painters in the business, but it will receive that new shine in our state-of-the-art BLOTHERM Down Draft Paint Booth.